GIORGIO MORODER-ON THE GROOVE TRAIN VOLUME 2 1974-1985. One of the founding fathers of Euro Disco was the Italian born producer Giorgio Moroder. His career started back in 1966, when he released several singles as Giorgio. It wasn’t until 1969 when Giorgio Moroder first enjoyed commercial success. His 1969 single Looky, Looky, which was released on Ariola Records was certified gold. This was just the start of run of successful singles, which he cowrote with Pete Belotte. Successful singles included 1972s Son Of My Father, 1977s Here To Eternity and 1978s The Chase, from the soundtrack to Midnight Express, which saw Giorgio win the first of three Academy Awards. However, while Giorgio Moroder released thirteen studio albums, ten soundtracks and enough singles to warrant the release of a four-disc box set, it’s Giorgio Moroder’s work as a producer and collaborator he’s best known for. Back in Novermber 2012, Repertoire Records released Giorgio Moroder-One The Groove Train Volume 1 1975-1993. Now six months later, comes the followup, Giorgio Moroder-One The Groove Train Volume 2 1974-1985. 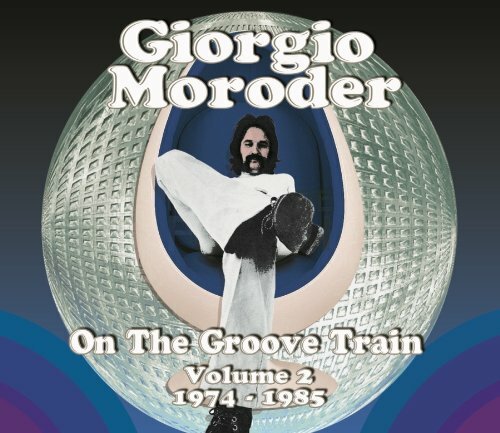 Just like Volume 1, Giorgio Moroder-One The Groove Train Volume 2 1974-1985 features a mixture of some of the Giorgio’s best known collaborations and productions, along with some hidden gems from his back-catalogue. Over two discs, there are thirty-three of Giorgio Moroder’s productions and collaborations. This includes contributions from Donna Summer, Chris Bennett, Tracey Dean, Karen Taylor, The Beepers, Madleen Kane and Melissa Manchester. Among the thirty-three tracks are rarities, B-side and hit singles aplenty. To help you decide whether Giorgio Moroder-One The Groove Train Volume 2 1974-1985 is a worthy addition to your record collection, I’ll tell you about some of the music on Repertoire Records’ recent compilation. My first choice from Disc One of Giorgio Moroder-One The Groove Train Volume 2 1974-1985 is Tracey Dean’s Moonshiner. This was Tracey’s only single. It was released on 13th September 1974, on Decca Records. Giorgio cowrote Moonshiner, which is best described as a raucous stomper, that’s very much of the glam rock era. Boy On The Ball, which was penned by Giorgio and Pete Belotte cowrote, has a similar glam rock sound. It also features a quivering Fergal Sharkey style vocal, and is quite different from the Euro Disco sound Giorgio Moroder is best known for. One of Donna Summer’s first collaboration with Giorgio was the 1974 single Denver Dream. It was written by Pete Belotte, who co-produced the track with Giorgio. On its released on Lark Records, the only country in charted was The Netherlands, where it reached number two. From the opening bars, the drama grows and Donna’s vocal has you captivated. While very different from the Euro Disco Donna’s best know for, you hear a tantalizing taste of one of the most successful and charismatic singers of her generation. The B-Side of Denver Dream. Something’s In The WInd also features on Disc One, and features a heartfelt, soulful vocal from Donna. Chris Bennett’s debut single was 1976s Disco Man. It was released on Bradleys Records and was written and produced by Giorgio and Pete Belotte. The B-Side was This Perfect Day, another Moroder and Belotte composition and production. This is much more the type of track most people would expect from Giorgio Moroder. Two years later in 1978, Giorgio and Chris released an album Love’s In You, Love’s In Me, which featured the hit singles Love Now, Hurt Later and Love’s In You, Love’s In Me. Madleen Kane features four times on Disc One of Giorgio Moroder-One The Groove Train Volume 2 1974-1985. This includes two singles from 1981. The first is You Can, a soulful slice of Euro Disco written and by Pete Belotte and Giorgo, who produced the track. Her other single was Playing For Time, which was also written by Giorgio and Pete, where elements of synth pop, Euro Pop and Euro Disco are combined. Of the other track Madleen Kane tracks, Don’t Wanna Lose You was the B-Side to the French release of You Can, while Mon Amour was the B-Side of You Can when it was released in Italy. These four tracks demonstrate just how Giorgio Moroder’s music was evolving after the demise of disco. The final track I’ve chosen from Disc One of Giorgio Moroder-One The Groove Train Volume 2 1974-1985 is Melissa Manchester’s Thief Of Hearts. Released in 1984 on Casablanca Records, this was a track from Melissa’s album Thief Of Hearts. This was a real collaboration. Melissa and Keith Forsey wrote the lyrics and Giorgio the music. Giorgo and Harold Faltermeyer produced the track, resulting in track with a classic Euro Disco, eighties electronica and rock were combined. Disc One of Giorgio Moroder-One The Groove Train Volume 2 1974-1985 features a selection of twenty-one eclectic tracks that demonstrate just who versatile a producer Giorgio Moroder was. The eleven tracks I’ve mentioned demonstrate this. There’s not just Euro Disco, but glam rock, soul, synth pop, Euro Pop, eighties electronica and rock on disc one. This demonstrates how versatile, innovative and bold Giorgio was as a producer. Often, he was way ahead of the musical curve. Rather than wait for musical fashions to change, Giorgio sought new musical genres. Instead of waiting for musical genres to become stale, Giorgio moved on musically. He was a leader, not a followed. So, these tracks chart the development of Giorgio Moroder as a producer, but also how musical fashions changed during this period. Will that be the case on Disc Two of Giorgio Moroder-One The Groove Train Volume 2 1974-1985? While Disc One of Giorgio Moroder-One The Groove Train Volume 2 1974-1985 featured twenty-one tracks, Disc Two features just twelve tracks. However, as we all know, it’s quality not quantity that counts. On Disc Two, there’s singles, B-Sides and rarities. Among the artists are Donna Summer, Speed Limit, Karen Taylor and Munich Machine. However, will Disc Two of Giorgio Moroder-One The Groove Train Volume 2 1974-1985 match the quality of Disc One? That’s what I’ll now tell you. During their career, Speed Limit only released four singles and one album. Their debut single was the novelty single Bump The Twist. It was written and produced by Giorio and released in 1976. The Disco Twist was the B-Side to Bump The Twist, which has a similar catchy novelty sound. Much better than The Disco Twist is Ann Joy’s Love Now, Hurt Later. This is a track from her 1980 album Love Dance. Written by Giorgio and Pete Belotte, Pete DeMillo produced Love Dance. Quite simply, this ia pulsating slice of hook-laden Euro Disco with a diva-esque vocal. The vocal augmented by rocky guitars which are the finishing touch to one of the highlights of Disc Two of Giorgio Moroder-One The Groove Train Volume 2 1974-1985. During his career, Giorgio Moroder collaborated with numerous other artists, songwriter and producers. One of these collaborations was with Paul Engeman in 1983. This resulted in the single Shannon’s Eyes, which was released in 1983. It was written by Tony Whitlock, Paul and Giorgio, who produced the single. During this dramatic and moody track, elements of synth pop, electronica, Euro Disco and rock shine through. It seems fitting that Munich Machine’s Space Warriors is my final choice from Disc Two of Giorgio Moroder-One The Groove Train Volume 2 1974-1985. Munich Machine was a disco project lead by Giorgio Moroder and based at his Musicland Studios. Space Warriors is a track from their 1979 album Body Shine. This is a truly innovative sounding track. Not only does it feature Giorgio’s trademark Euro Disco sound, but It’s combined with futuristic, space-age sounds and rocky guitars. The result is a classic track from one of Euro Disco’s founding fathers…Giorgio Moroder. Although Disc Two of Giorgio Moroder-One The Groove Train Volume 2 1974-1985 only has twelve tracks, it’s the quality that counts. Mostly the quality continues, but there are the occasional musical faux pax. Mind you, considering how prolific a songwriter, producer and collaborator Giorgio Moroder was, that’s excusable. The majority of the music on Disc Two sees the innovative music continue. Not only is the music innovative, but it inventive and bold. Part of Giorgio’s success was his ability to be versatile, and change direction musically. Rather than wait until a musical genre was dying, Giorgio was looking for “the next big thing.” An example of this was disco. Some artists, songwriters and producers thought disco would never die. Giorgio realized this wasn’t the case and look for the future post disco. During part of the period covered by Giorgio Moroder-One The Groove Train Volume 2 1974-1985, disco was King. Over in Europe, Giorgio Moroder established a reputation as one of founding father’s of Euro Disco. Ironically, Euro Disco outlived disco’s popularity. Post disco, Euro Disco survived and thrived. All the time, Giorgio was looking towards the future. He was wondering where music was heading, and was determined to be at the heart of music’s future. That’s no surprise. After all, Giorgio Moroder was an innovator, who influenced and shaped the direction and future of music. Proof of this is on Giorgio Moroder-One The Groove Train Volume 2 1974-1985, which is a perfect primer to one of the founding father’s of Euro Disco. Standout Tracks: Donna Summer Denver Dream, Melissa Manchester Thief Of Hearts, Ann Joy’s Love Now, Hurt Later and Munich Machine Space Warriors. ← GOLDEN GATE GROOVE: THE SOUND OF PHILADELPHIA IN SAN FRANCISCO-1973. Another CD I was looking to purchase. Thanks for the review. M & M Mixes volume 3 will be released in the states on Tuesday(30th) I can’t wait. Are you going to review the Tabu reissues???? Thanks for your comment. Glad you enjoyed the M&M Mixes Volume 3. You’ll really enjoy it. It’s been on constant play since I got it. There’s a lot of great stuff out very soon. As for the Tabu releases, watch this space. Keep enjoying the blog.